Repaints at Milehouse have clearly stepped up a notch or two recently. 207 is the latest Optare to be painted out of green. As many have noted it still looks odd with the green LED display but this is due to be sorted once the software has arrived to change them orange! Focus Transport: First Great Western have introduced a Pullman Dining menu on some of their services. the plymouth citybus volvo b7rles that has not been repainted into blue flash liberty might be a part of the yellow flash or they will swoop them to! i would rather have them swooped than them being yellow flash buses! the 12 plate volvos will not be yellow. 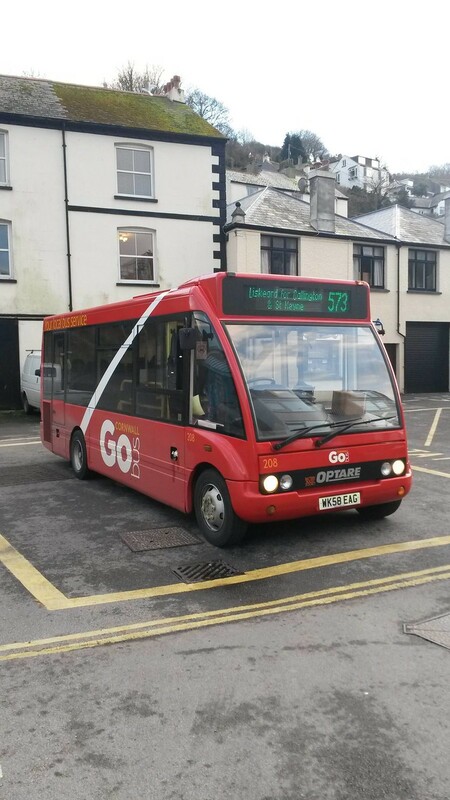 Go Cornwall red swoop liveried Solo 206 was working on Citybus route 25 today (Wednesday 25th February). Route number was on a piece of paper stuck inside the windscreen. Darts 10 and 14 are parked with most of the other withdrawn Darts in the Lower Yard. Dart 16 is now the oldest one in service. Green Go Cornwall Solo 209 used on Citybus route 49 today (Saturday 28th February). Again the bus had a paper route number stuck on the windscreen.